Get Magento 2 Configurable Product Wholesale Display extension for a perfect performance for configurable products having more than 3 attributes with unlimited values! Let's try Magento 2 Configurable Product Matrix View extension for new and brilliant performance for configurable products in Magento 2. If you want to set a minimum quantity of configurable product, you can download Magento 2 Magento Minimum Quantity of Configurable Product extension here. In case you need to get URL for each child product with preselected options, download Magento 2 Simple Details on Configurable Product extension. Like Magento 1 version, Configurable Product Grid Table View for Magento 2 helps store owners to provide a better display for their configurable products replaced for the drop-down list in Magento default. Customers do not have to choose custom options, but they just add their desired quantities for each children product and then they can put all of them to cart by just one click. Therefore, Configurable Product Grid Table View for Magento 2 is an ideal choice to enhance the shopping experience for wholesale customers with a quicker purchase process. Display price range for the configurable products. This range is determined by the lowest and highest one among prices of children products. Enable to choose to show unit price of children products. Or admin can choose to show only when children products have different prices. Besides, the extension supports to display special price for each child product on the table. 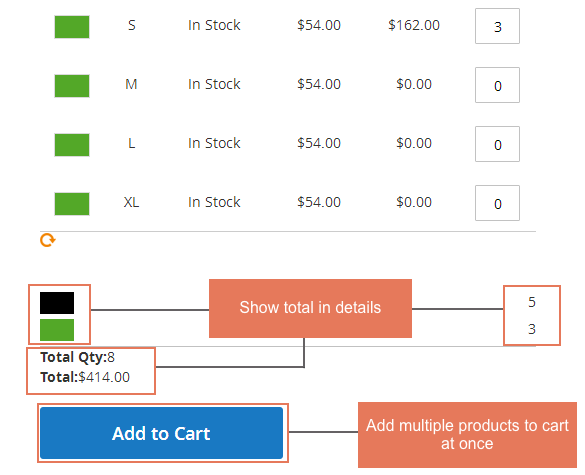 Customers can add multiple simple products to cart at once by a single click. Customers choose their own quantity for each associated products and then click “Add to Cart” button to put all of them in their cart. That is really suitable and convenient for wholesalers. Automatically calculate total amount when selecting quantities of products in the table. Show total quantity and total price at the bottom of the table. Why Configurable Product Grid Table View for Magento 2 extension is your must-have extension? As you know, configurable products in Magento default are displayed in the drop-down list with custom options for customers to choose. However, it becomes very difficult for not only store owners to manage but also buyers to purchase quickly. 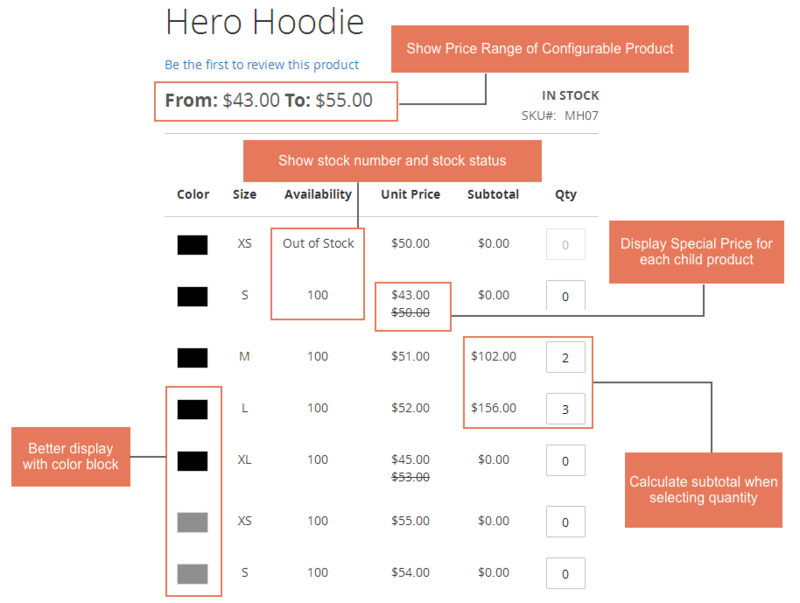 Therefore, Configurable Product Grid Table View for Magento 2 is considered as a breakthrough in bringing a very convenient display for configurable products when all children products are shown in only a table along with necessary information such as availability, price, quantity and so on. This surely brings a lot of benefits for store owners as well as convenience for customers, especially wholesalers, when doing shopping in the stores. As mention above, when all simple products exist in a table with Configurable Product Grid Table View for Magento 2, customers can now purchase many items simultaneously without buying products one by one with choosing custom options as normal. Especially, it’s an ideal extension for wholesale business when customers mainly order a large quantity of product. Therefore, this module helps them to save much shopping time as well as brings better experience in the sites. It’s of course that an easy and fast buying process can encourage customers to purchase more and more, which makes sales boost up effectively. In addition, better shopping experience keeps customers loyal to stores and come back for the next time to purchase. Therefore, this is also a factor that results in the sales increase for Magento 2 web-based stores. This plugin covered my needs, exactly what I need! It had some problem with price in UAH, but support solved it very quick. This configurable product extension is really helpful. By showing all simple products in the table, my customers order easily. You have enthusiasm support team. Thank your team a lot. Can you add the minus/plus button beside the quantity box? I started owning a magento shop not a long time ago, so that I really need to get a great support when I buy an extension. And BSSCommerce doesn't let me down :) They answer my questions all clear and so quick. Now I have successfully install the extension and there is no problem while using it. I have come up with this extension through crunchbase and I must say I am surprised when using this extension. It's so easy to install and to use. The backend is really simple yet it still contains enough features that I expected with this price. Feedback from my customers are good. They find it very convenient to order many products at the same time. Thanks so much! I have tried Magento 1 version of this extension and after upgrading on Magento 2, I really want to have it again. This extension still has some awesome and useful features in Magento 1 along with superior ones from Magento 2 and I still get full support from the service team. There is nothing that I can complain about! Highly recommended to install for Magento 2 sites! I have just installed this extension and it is working very well. I have some questions and the support team answers all of them very clearly. Also, this extension has more functions than some other products. This is the first time I buy extension from BSSCommerce and it's a really pleasant experience. The service team is wonderful and the module works perfectly, just as I expected. Highly recommend this extension !! So easy to control. And it does exactly what it shall do. One more thing that makes me love this extension more is the support team :) I get full support from BSSCommerce whenever I need. Thank guys! The backend is really easy to control. I am new to Magento but I can master this extension within minutes. And its function is really helpful for my business when one wants to buy wholesale.